Nonetheless, many of these Jewish friends made an irrevocable break with Heisenberg for his refusal to abandon Germany. They took this not as a sign of patriotism, which they had no comprehension for, but rather for a pro-Nazi outlook on the part of Heisenberg. 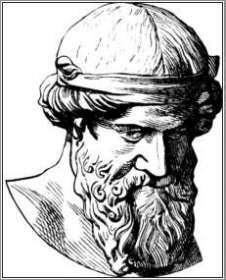 They conveniently forgot his acts of kindness and began organizing themselves in the United States for a war. A war against Germany - but also Heisenberg. One of the Jews who emigrated from Germany was Leo Szilard. It was Szilard who, taking the idea from an H.G. Wells novel, patented the design of a nuclear chain reaction. 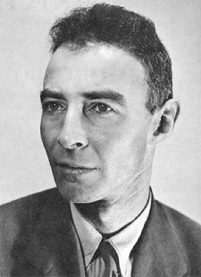 Upon relocating to the United States he immediately, perhaps obsessively, began spreading the word that Germany was working towards building atomic weapons. In truth, even world-renowned physicists such as Niels Bohr denied that a bomb could even be constructed. 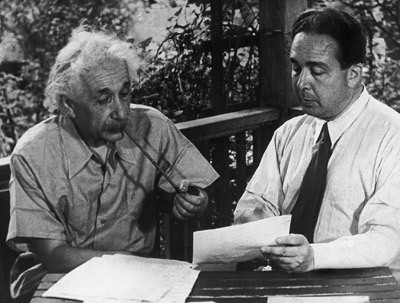 Einstein and Szilard draft a letter to President Roosevelt. In July 1939 Szilard and Eugene Wigner paid a visit to Albert Einstein to discuss the possibility of German atomic weapons. At first they planned to contact the Belgians in an effort to keep Belgian-controlled uranium ore from falling into German hands. Eventually they settled on another approach. Szilard's friend Alexander Sachs was a Russian-born Jewish financier with access to President Roosevelt. "In America," said Sachs, "it's the presidents who get things done." Thus the letter was written in which Albert Einstein famously warns President Roosevelt of the possibility of creating atomic bombs and a likelihood that Germany is exploiting Czechoslovakian uranium mines for this exact purpose. In October Alexander Sachs himself would deliver this letter to President Roosevelt. It was this letter that was the catalyst for an American effort to create nuclear weapons. It was created as a reaction to the "threat" posed by German atomic weapons. A "threat" that never existed. 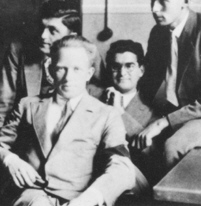 Weisskopf sits behind Heisenberg in 1930. By 1944 the Allies had failed to kill Heisenberg by bombing raids so the Office of Strategic Services drew up another plan to elminate Heisenberg. 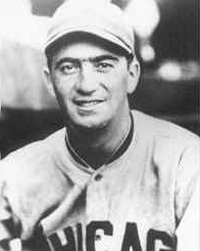 They recruited former Red Sox catcher and Princeton University graduate Moe Berg for the job. The Jewish polymath could speak multiple languages but was perhaps not the ideal secret agent. After boarding a plane in May 1944, he leaned over and a pistol fell out of his jacket. "They gave me this as I came aboard." he told fellow passenger George Shine. On May 3, 1945 Heisenberg was captured by the Allies. He and the other scientists involved with nuclear research were detained in England for a number of months so that information could be gathered from them. The war against Heisenberg was over. 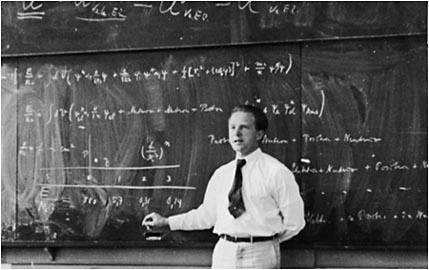 Another excellent essay on Jewish/German physics is available here.